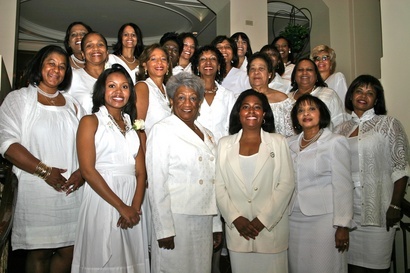 The Hoffman Estates chapter of the Links Incorporated was charter as the 189th chapter of the Links, Incorporated May 12, 1984 and has provided services to the Elgin/Northwest Chicago Suburban communities for almost 30 years. In the early 1980’s, 15 women from the Northwest Chicago suburbs met to discuss promoting civic and social consciousness among African Americans. As Black women living in a predominantly white area, they witnessed government programs directed to minority communities being systematically decreased or eliminated. They knew that they had to polarize their efforts to make a difference. “Chains That Bind” was born with Doris Bundy Noble as the organizer. To support their initiatives they held their first “Day at the Races” fundraiser on July 24, 1982. This event is still held annually and is the primary fundraiser for supporting the chapter’s programs. 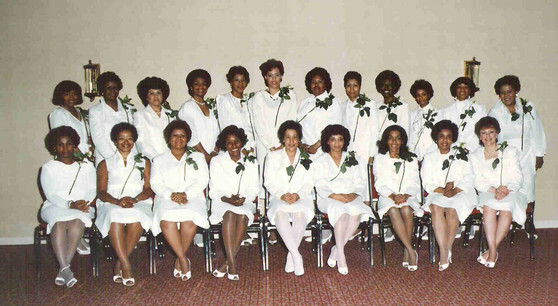 The Links Incorporated encouraged their efforts and on May 12, 1984 with 22 members, they became The Hoffman Estates Chapter of the Links Incorporated. “Basket of the Month” was the first service project and was initiated to supplement the food purchasing power of a needy local family. A traveling exhibit obtained from the Smithsonian Institute entitled "Black Women - Against All Odds," provides autobiographical data on Black women throughout history who have made significant contributions in business, medicine, the arts, education and science. This exhibit is on display in numerous libraries and schools in the area during the year. In 1993 the "If I Could Create a World" project was implemented. Students from Nairobi, Africa and Elgin, IL submitted drawings, poetry, essays and photography expressing their interpretations of the theme. Professional artists chose 12 finalists who were recognized at awards receptions at St. James AME Church and Elgin Community College. Through the International Trends facet, the chapter raised $10,000 toward the building of a school in the KwaZulu-Natal Province of South Africa. The chapter also collaborated with the Chicagoland Area Cluster Chapters to build a school in the same province. Under the National Trends facet the chapter supports the Community Crisis Center in Elgin. The Center is a home for battered women with children. Chapter members serve at the soup kitchen and provide toiletries, diapers and other necessities and host a Christmas party for the children. In 2003 the Arts Facet partnered with Garfield and Abbott Middle Schools to increase student’s exposure to the arts. The chapter took students to the DuSable Museum of African America History, Alvin Ailey Dance Theatre performances and plays (one entitled “Harriett Tubman”). From these activities the "Links to the Future" mentoring program was formed with the goal of increasing self-esteem in girls by encouraging them to develop their artistic talents. In 2010 the chapter sponsored a series of lectures on South Africa, Sudan and Haiti, including "Haiti after the Earthquake" with guest lecturer, Professor William Balan-Gaubert, from the University of Chicago. The Chapter adopted the Good Samaritan School in Carrefour, Haiti which sustained serious damage during the earthquake. The chapter partnered with the University of Iowa to purchase and deliver water purification kits which provided water for 90,000 persons. The chapter also arranged for the delivery of truckloads of clothing to Haitian children as a part of the relief effort. The Health facet collaborates with the Gail Borden Library (Elgin) to promote family health and fitness by providing low-fat cookbooks, hoola-hoops and jump ropes. The also chapter partners with The Walter and Connie Payton Foundation to support underprivileged children and the Links Inc. Signature Program “Project LEAD”; designed to close the academic achievement gap of middle school students. The Chains that Bind presented their first scholarship in 1983 and under the Services to Youth facet, continue this tradition by annually awarding scholarships to high school seniors in amounts ranging from $1,000 to $5,000.